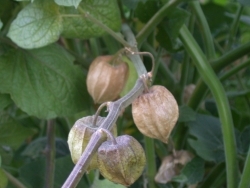 The cape gooseberry is a low lying bush with its bright orange berry enclosed in a pale brown parchment like case called the Cape. 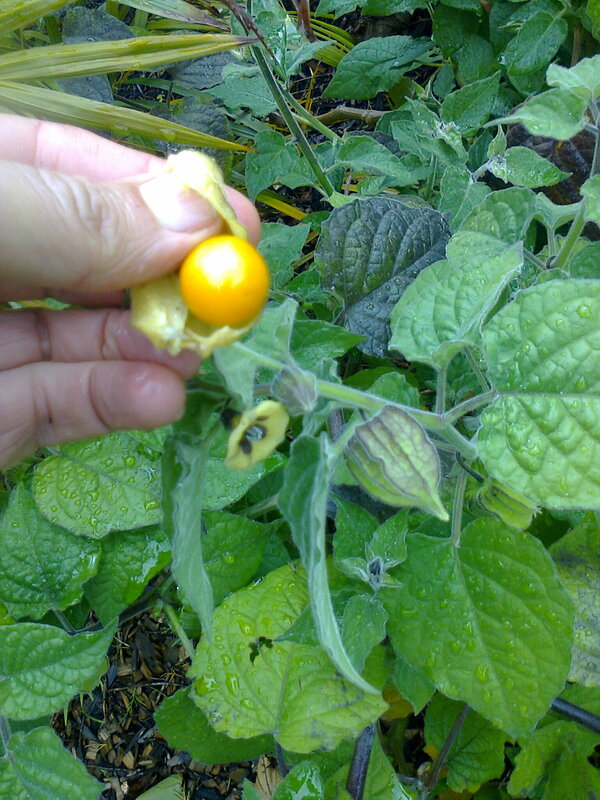 The berry is the size of a cherry tomato is very aromatic and full of tiny seeds. 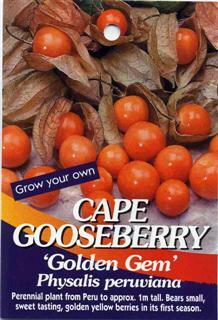 They are delicious eaten straight from the Cape or made into gooseberry Jam. They can be added to salads, desserts and cooked dishes, they are delicious stewed with apples or dipped in chocolate. They can also be dried or used in savoury dishes with meats and seafood. 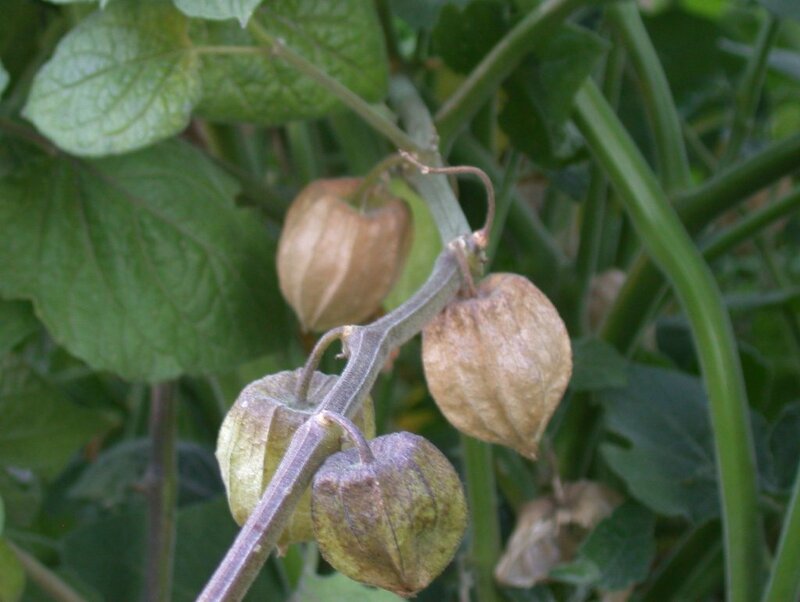 The small cucumber beetle also enjoys feasting on the cape gooseberry although they munch only on the leaves. Hand pick any beetles that you see as they are capable of breeding into large numbers very quickly. I find this plant likes it's manure and good watering. Too much water may make the fruit less tasty though. Comments: - Easy grow and quick to get fruit. Old fashioned fruit; my grandma had them growing next to her outdoor toilet 50 years ago! I grew mine from seed I bought online. Some of the plants produced poor tasting fruits and others had good tasting fruits, so I just left one or two good ones. Self-seeds a bit. Tasty to add a few into a fruit salad. Usually the ones that have fallen off and laid on the ground for a few days are the tastiest. But all cape gooseberry plants I've sampled have a rather acid taste, so I don't think you can eat a cup full without getting a belly ache. 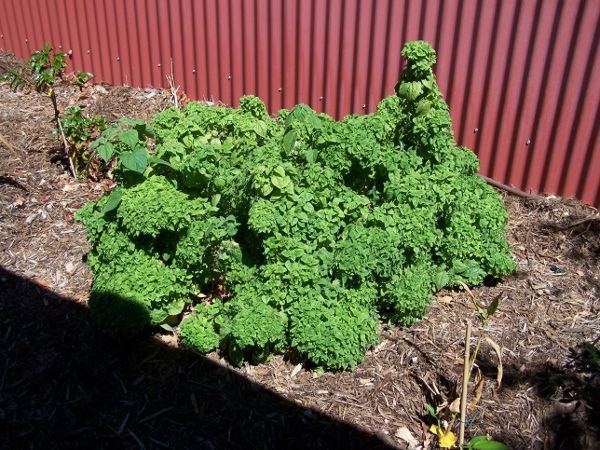 I've grown it in Perth and Sydney. I find the plant to be short-lived, at least in Sydney's clay. After a year or two it looks sick so I pull it out. 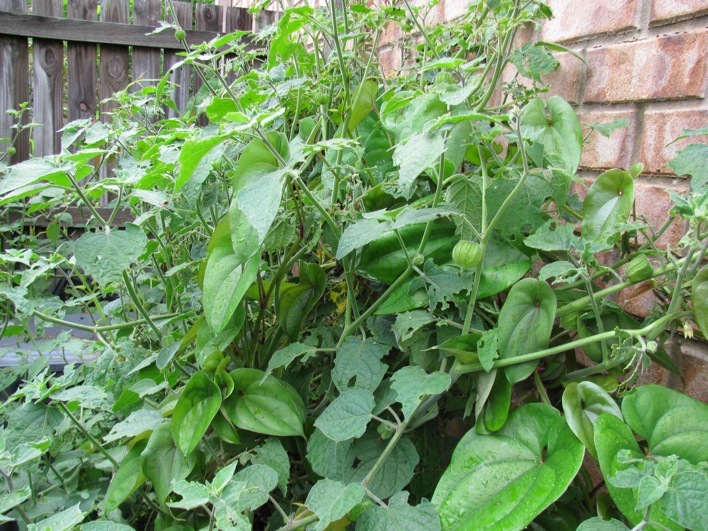 Always more self seeds coming up though, so just let a new one grow.Never had one damaged by Med fly or Qld fruitfly. None. Pests don't seem to bother it. Comments: - Grows wild, mostly in cleared areas. 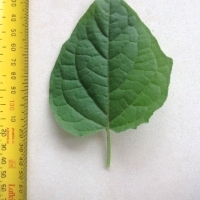 A better weed than most, soft wooded, no thorns, edible fruit. I have to harvest them as soon as the crop starts before fruit fly get into them. 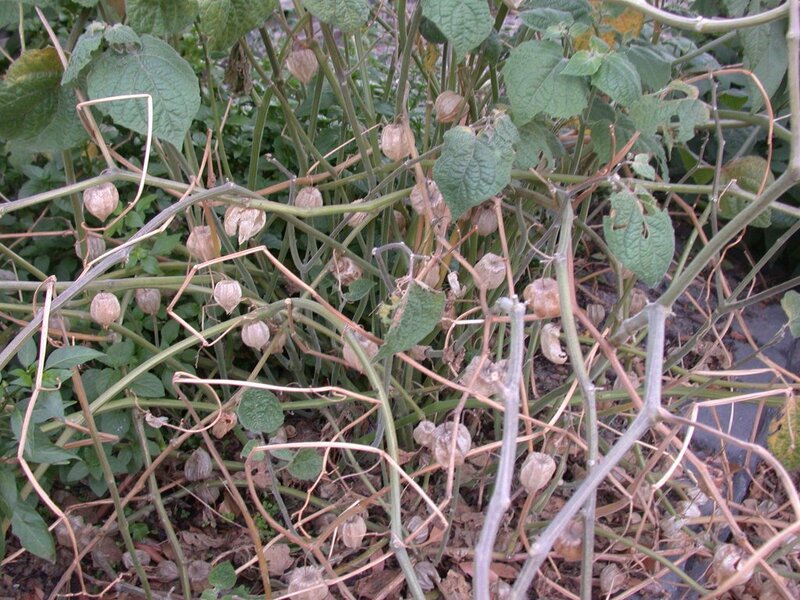 Comments: - Cape Gooseberries are so easy to grow. You just bury one of the fruits (you can probably grow them from cuttings too but I've never bothered) and water occasionally. 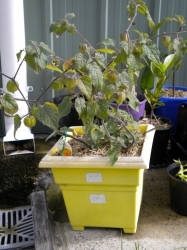 The require no maintenance at all, although you may need to cut the plants back because they grow so vigorously and you will get new plants self seeding from fallen fruit every year. The fruit are very attractive and fun to pick as the fruit grow individually inside paper lantern-like cases. When fresh the fruit resemble a cherry tomato and are very juicy with a sharp/sweet flavour, reminiscent of apricots. The fruit can also be left to dry on the bush (although many will fall when ripened before drying out). When dry the fruits a wrinkled and somewhat leathery with a much sweeter flavour. Kids love to pick and eat these. 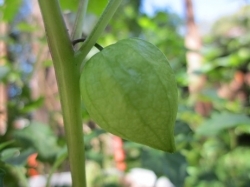 Question: I've been told that it can be harmful to eat unripe Cape Goosberry fruits. Do you know if this is true? Another embarrassment of riches. It fruits prolifically here and has out grown its first planting location. It has now been divided up and replanted against the fence where it can sprawl to its hearts content. 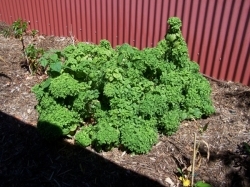 Looking forward to the next seasons harvest, should be more than enough fruit to preserve some..
Annuals. Seeds save well for following year. I mix them through the herb bed and also have them in pots. I have 2 different sorts of these - a yellow and a green variety. I am told that both should go yellow when it ripens but I kept fruit from last season and they stayed green until I broke it open to plant the seeds this year so I don't know what sort that is! I really like adding the fruit to salad. They have a lovely tomatoey flavour and I like the seedy texture. They also dry well in a dessicator and retain a strong flavour. 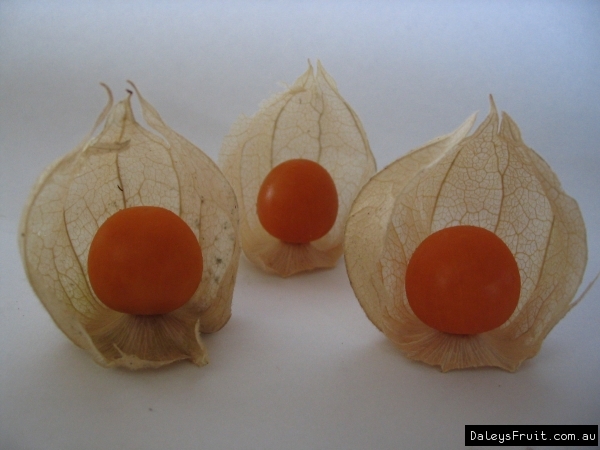 Summer 2011: John gave me a gift of some mamoth cape gooseberry seeds. I have planted them but nothing is up yet. Not surprised though, the weather has been so cold and wet that nothing much is coming up - not even my flowers! I got rid of the larvae with a good sprinkle of corn flower over a couple of days and the bugs I did find I flicked them into a bucket of water- I felt awful but they were decimating my plant. grown for 2 years and it out of control as they do.. Sitting in pots on my patio. Summer 07/08 some very hot high 40's temperatures. It did fruit and was delicious. Bought a plant years ago and planted it out. Have seedlings coming up now... not sure if from mine or elsewhere. When I find them fruiting, I check what's inside the husk and eat them, to prevent weedy spread, and also because they are quite nice! 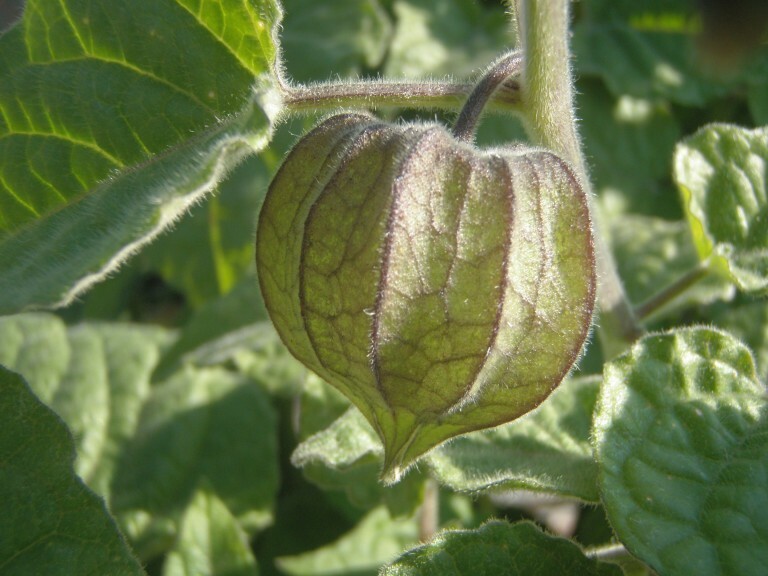 (Sometimes I find what I guess may be Tomatillos, a Cape Gooseberry relative, also coming up uninvited. They seem to prefer moist places, because I find the self-seeded ones most often in semi-shade, moist spots. 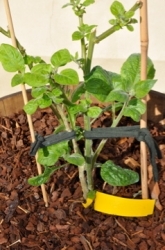 Husk seems to prevent pest problems. 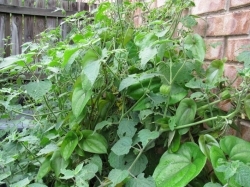 The plant is more likely to become a pest, even if tasty. Planted by a friend in the ornamental garden. Tough as nails and able to get a smattering of fruit this year. Comments: - My favourite childhood memory involves sitting in front of my great grandmother's cape gooseberry, eating the delicious yellow fruits. I wanted to grow one of these to recapture the taste of my youth! 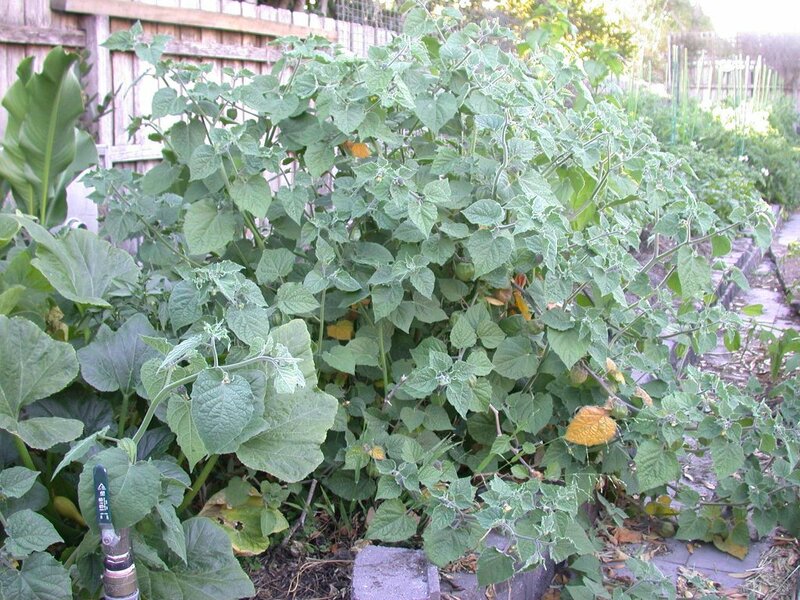 Potato beetles decimate these so I get very few fruit but each year another plant appears somewhere in the garden. Comments: - Struggled with powdery mildew/mould, but treated with pruning and training to separate the crossed branches, and moving to spot with better air movement, plus treatment with copper fungicide. Seems to be recovering well. 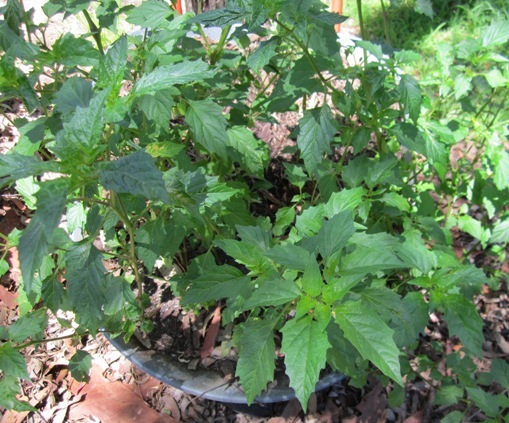 Volunteer from under compost bin. 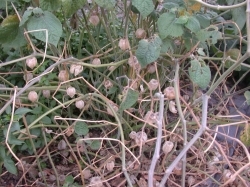 This plant is attacked by three striped beetle every year, but bounces back and fruits well for long periods of the year despite this. The fruit is really nice, slightly tart. African yam (heart shaped leaves) is also a volunteer from the compost. This yam tastes nice grated and washed in lemon juice water, but oozes slime when cut, like a lamprey. Comments: - Growing in a medium sized pot with premium potting mix. I give it a weekly dose of worm castings and regular watering. It has only been in the pot for a few weeks and it has gone froma straggly stem to a bush! I am very excited to taste the fruit! I want this just so that I can make gooseberry jam for my best mate's dad. It's his favourite. Very rootbound when I first planted it. Hopefully will survive. It lives!!! Starting to get much new growth. I like the fruit but this does not seem very prolific, seems hardly worth it. Did have, Frost got to it before fruit was mature. Organic matter applied to bed before/after planting. Comments: - Growing mainly from self seeding now . Yummy little berry in a cute little cape .everyone loves them and fairly easy to grow , grows from cutting or seed . Prone to same things as most solanaise . 24/5/13 those big brownish ladybugs ate the plant the berrys looked so cool. An unusual tasting fruit in a cute package. 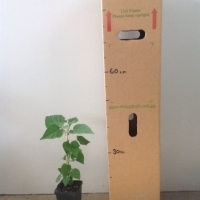 I tried one on the plant in Bunnings and thought it might be interesting for the kids. These used to grow wild on the island where I grew up. Finally suceeded in growing these during the last winter season. Curious to grow this fruit and see what it tastes like. Will net from birds when fruiting.